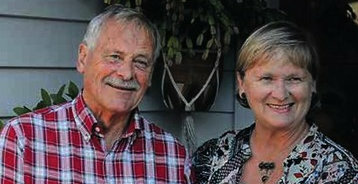 Popular couple Helen and John Chipper are joining the remainder of their family in Auckland from this month. Plimmerton said goodbye to long term residents Helen and John Chipper last month. John and Helen who owned and operated Moana Lodge for 15 years have relocated to Herald Island, Auckland, to be closer to their children and grandchildren. “It was a hard decision to make,” said Helen. “But it was an ‘age and stage’ thing really. We knew if we wanted to be involved with our family we had to move where they were. We were the only ones left in Wellington, and with our son moving back to New Zealand from the UK, they are all in Auckland now. John and Helen were both school teachers, but they switched to the accommodation industry, when they bought Moana Lodge. Then it was quite run down and they developed a 10-year plan that involved bringing the lodge up to five-star standard. Their work has paid off in many ways, as they built an international reputation with 95 per cent of guests coming from overseas and nearly a third of bookings on the recommendation of previous visitors. For eight years Monaa Lodge achieved the top rating for the Wellington region in the annual Budget Backpackers Association survey of guests. And it was rated as “exceptional, immaculate and inviting” in the 2007 Lonely Planet Guide to New Zealand. The news they had achieved the top rating came four days after their first grandchild was born – so it was a whirlwind few days. They sold the lodge in 2012, when it was a highly regarded backpacker accommodation, and it achieved Qualmark’s top five-star rating. Qualmark is New Zealand tourism’s offical mark of quality and Moana Lodge joins an exclusive club of just 14 backpackers in New Zealand, three of them in Wellington, with the five-star rating. John said that they took some time to find the right location in Auckland. The owner at Moana Lodge is now Danny Harding, who has put his own stamp on the property. He is ex Navy, and Helen laughs that the sheet corners on the beds are razor sharp, given his attention to detail… and training. Danny said he has a personal passion for guests and backpackers. 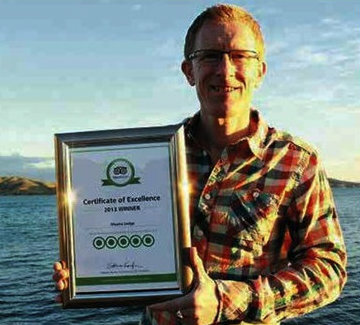 And it must be working – Moana Lodge and Danny won first place in the BBH National Quality Awards this year, and additionally, received the Certificate of Excellence from Trip Advisor.